Syracuse, NY (August 27, 2018) - The Syracuse Chiefs overcame a two-run deficit to beat the Rochester Red Wings, 6-3, on Monday night at NBT Bank Stadium. With the win, Syracuse is 18-12 since July 27th. In those 18 victories, the Chiefs have come from behind ten times. Syracuse (59-74) trailed, 3-1, entering the bottom of the sixth inning. With one out, José Marmolejos and Yadiel Hernandez both singled, putting runners at first and second base. After a Moisés Sierra strikeout, Pedro Severino walked to load the bases. Adrian Sanchez followed with a singled into right field moving Severino to third and scoring Marmolejos and Hernandez to tie the game up, 3-3. Irving Falu then laid down a bunt for a single, bringing home Severino to give Syracuse a 4-3 lead. The Chiefs added a pair of runs in the eighth. With one out, Sierra doubled. Two batters later, Sanchez doubled into the right-field corner, plating Sierra to push the Syracuse edge to two, 5-3. Falu followed with a single into right field that scored Sanchez, extending Syracuse's lead to three, 6-3. Rochester (59-73) jumped out to the lead in the top of the second inning. Kennys Vargas led off with a double off the right-field wall. LaMonte Wade followed with a single to score Vargas for a 1-0 Red Wings edge. Wade moved to second base during the play on the throw home that tried to get Vargas. Two batters later, Wade scored on a Juan Graterol double to right field to give Rochester a 2-0 advantage. Syracuse scored its first run in the bottom of the third. With two outs, Victor Robles doubled to left field. Matt Reynolds followed with double down the right-field line to bring home Robles and cut the Rochester lead to one, 2-1. The Red Wings lengthened their lead in the fifth. Byron Buxton led off with a double. Nick Gordon then singled to right field, advancing Buxton to third and Johnny Field followed with a double to center field, scoring Buxton to make it a 3-1 ballgame. The Chiefs now hit the road for the final time this season. 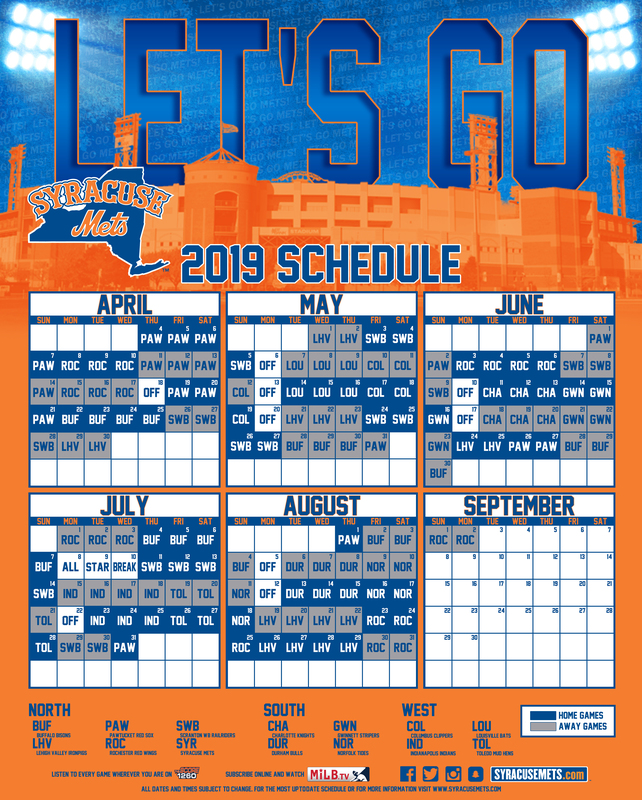 Syracuse begins a three-game series in Moosic, Pennsylvania on Tuesday night against the Scranton/Wilkes-Barre RailRiders. RHP Austin Voth is scheduled to start on the mound for the Chiefs opposite RHP Adonis Rosa for the RailRiders. First pitch is set for 7:05 p.m.